Yes, I do natter on a bit about wood storage. But this is the time of year when we can do the necessary maintenance on the property to get ready for winter, and with autumn just a day away (and you can definitely feel it in the air, and I don't miss summer one bit), we need to keep at it before we must fill the wood boxes with firewood again. Lisa has attached the new lid to the large box. 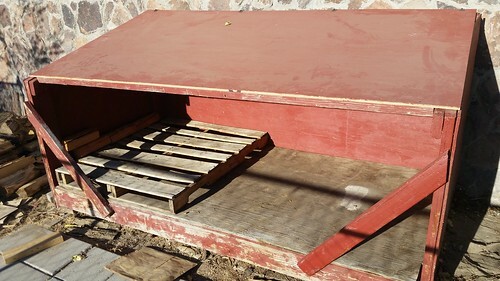 She plans to put pallets in the bottom (one is already there, as you can see) so that air will circulate around the wood and that any water that does get into the box will drain out the bottom rather than letting wood sit in puddles and mildew. This is not a theoretical consideration. The white spot on the bottom lining board is where a piece of cordwood got all moldy and started infecting the area around it with a science project. Repainting the big box has to wait until Lisa has finished the work on the new small box, because she wants to try and get as much of the painting done at once as she can, to minimize the number of times she has to clean the paintbrushes.